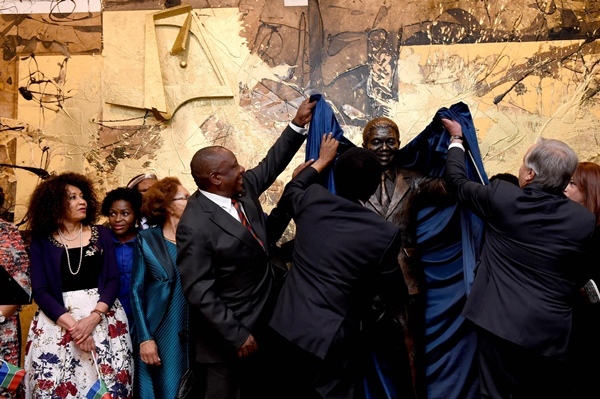 This statue will be a constant affirmation of South Africa’s commitment to contribute to a better world for all, Ramaphosa said at the unveiling. 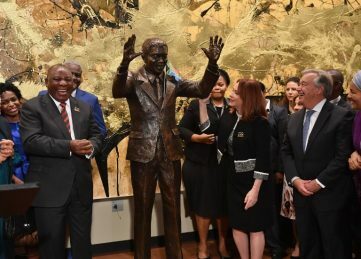 The statue of former South African President Nelson Mandela will remain a constant reminder to the international community of his dedication to the mission of the United Nations (UN), President Cyril Ramaphosa said today. “We trust that this statue will remain a constant reminder to the international community of the dedication of Nelson Mandela to the mission of the United Nations and a constant affirmation of South Africa’s commitment to contribute to a better world for all,” Ramaphosa said at the unveiling of the Mandela statue in New York in America. He said South Africans have been humbled by the enthusiasm with which the international community has embraced the celebration of the centenary of the birth of Mandela. “The people of our country, united in their diversity, revere Nelson Mandela as the founding father of our democratic nation – whose life, sacrifices and extraordinary contribution to freedom continues to inspire successive generations,” he said. The life-size statue of Mandela was unveiled at the UN General Assembly, New York. “We recall with great appreciation and gratitude the leading role of the United Nations in championing the struggle of the South African people against apartheid and in calling for the release of Nelson Mandela and other political prisoners,” Ramaphosa said. Mandela died on December 5, 2013. He was 95.